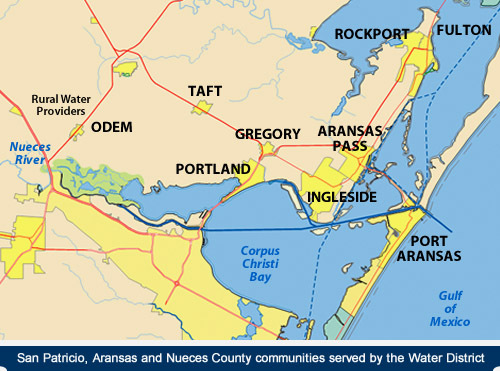 The San Patricio Municipal Water District serves the area north of Nueces Bay and Corpus Christi Bay on the South Texas coast. We are the wholesale water provider for communities and industrial employers in San Patricio, Aransas and eastern Nueces counties. Our industrial customers are located on or near the Port of Corpus Christi’s La Quinta Ship Channel. The Water District provides drinking water to wholesale customers. These customers are municipal water systems in Odem, Taft, Portland, Gregory, Ingleside, Aransas Pass, Port Aransas, Rockport and Fulton and to two rural water supply corporations in central and eastern San Patricio County. These systems provide water to homes and businesses. The district’s daily mission is to reliably meet the water needs of each of our municipal and industrial customers. For households that means providing water that is safe to drink and meets expectations for taste. For industrial users it means producing and delivering water that meets the specific quality requirements of individual industrial customers. The Water District is in the business of providing essential infrastructure to our wholesale customers. This system allows communities to prosper and industries to employ thousands of area residents. The Water District was created by the Texas Legislature in 1951 and is governed by an eight-member board of directors. Member communities are Odem, Taft, Gregory, Portland, Aransas Pass, Ingleside and Rockport. Seven directors are elected from member communities and the eighth member, traditionally someone familiar with the district’s industrial customers, is appointed by the rest of the board.